Publishers a joint venture of India Today, and Harper CollinsPublishersIndia. 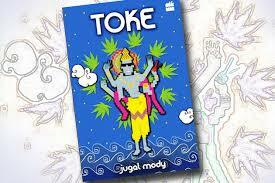 the book is about Lord Vishnu showing up one morning, when the protagonist ..Nikhil—also known as double battery is stoned. He asks him to rescue the world from being invaded by maggot zombies. On this hero’s journey( sorry Joseph Campbell must be turning in his grave.) he gets to romance his dream girl colleague and even kiss her! Then there are two side kicks, a mentor crow all who are stoned. Two Japanese girls who speak the Delhi, impression of Japanese accented English. For the first time I actually was reluctant to pick a book after going through the first chapter. Next PostNext Bird in the cage.